The question the Ascend P7 ultimately raises is do you really need to spend an extra R3 000 or R4 000 for a similar smartphone, when you can pick such a solid performer up for quite a bit less at R 6 700? The Ascend P7 immediately impresses on a number of fronts. Firstly, despite boasting LTE, it is nonetheless laudably slim (6.5 mm) and well designed, sitting comfortably in the hand. More importantly though, Huawei has wisely seen fit to eschew cheap-feeling plastic in favour of a more metallic frame, which lends it a premium feel. This is also aided by the fact that it the Ascend P7 is a solid slab of technology, with no finicky or flimsy back covers to contend. It also of course means that the battery is not user replaceable, although this was hardly an issue, considering the battery life and features on offer (more on this later). Instead, your SIM card and microSD card are inserted via side slots, which is actually preferable if you tend to SIM-swap or manage multiple microSD cards. The very favourable first impression continues as you delve a little further into what the phone has to offer. 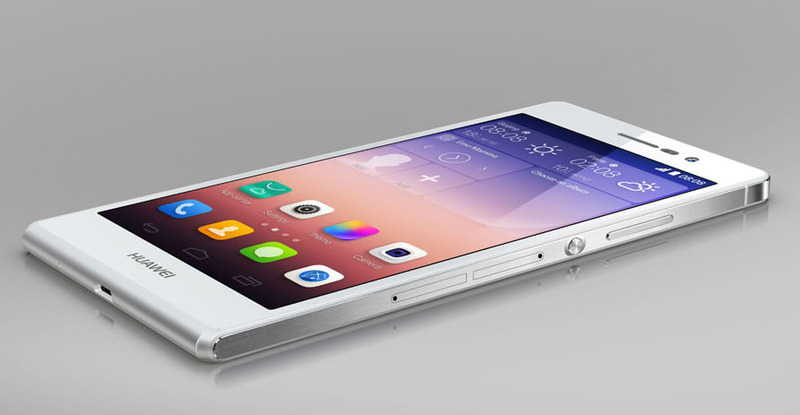 While last year’s Ascend P6 was a decent phone, to our minds, its successor is leaps and bounds ahead of it. We were particularly impressed by the 5” screen, which boasts a full HD (1920x1080) resolution (445ppi), and looks sharp and rich. Also onboard is a very capable processor in the form of a Hisilicon Kirin 910T quad-core 1.8 GHz CPU, along with 2 GB of memory, which we found offered a very good performance all round. The phone certainly didn’t struggle with Google’s latest OS, Android 4.4 (KitKat). As has become the norm on most higher-end smartphones, the Ascend P7 offers 16 GB of storage, expandable via microSD. The Ascend P7 is certainly an attractive and stylish looking phone, and its appeal is further enhanced by a beautiful screen. Huawei believes the P7’s 2500 mAh battery can last up to two days during normal usage, but for the most part you’ll receive a day before a trip to the power point. Moreover, we have found that entering power saving mode (a new feature on the P7) has certainly enabled us to extend our usage when the battery started running low. This is one feature that we suspect will become most useful though on any forthcoming trips, given new regulations into certain territories requiring travellers to be able to turn on their phone before boarding an aircraft. Also, we must hand it to the P7 - the battery managed to sustain its charge for an extended period when not in use. In our experience, this meant we didn’t switch it on to receive the nasty surprise that the battery was running low after been powered off for some time. As we prefer using our phone on speakerphone rather than pressed to the side of our head, we were particularly pleased by the phone’s speaker, which is loud and clear. One of the features that was played up quite a bit by the company, was revamped onboard cameras. Considering how often people tend to resort to their phones to snap a quick shot or ten, there’s a particular new feature that stood out in this regard and that we particularly appreciated. When the device is asleep, one need only tap the volume button twice and it will automatically take a shot - no delays, no need to find the camera app, just two quick taps and 1.3 seconds later the deed is done. In practical terms, this makes catching the quick, presumably emergency snapshot much easier. Not hurting matters is that the image is rather good as well. Admittedly, we are not young enough or so inclined to take dozens of selfies, but make of it what you will, clearly, this trend isn’t going away anytime soon. In cognicance of that the P7 Ascend has also upgraded its front facing camera - up to 8 megapixels now and also offers a wider angle, presumably not just for selfies but for Ellen Degeneres style groufies as well . Granted, other than the occasional video chat, this doesn’t really factor much into our usage, but it brings to light the crux of the Ascend P7 itself - the wealth of features onboard. What really impressed though is the raft of solid features onboard, along with the sense that one is receiving value for money from a premium product. Some Android users might not like the fact that there is no separate apps menu that shows your all your apps. Instead the P7 uses your regular screens to accommodate all your apps. It takes some getting used to, and forced us to use folders a lot more. If there is one tiny feature that stands out which we thought would never make a difference, it is how Huawei manages new SMS messages. Taking into account the amount of spam messages sent these days, the ability to have direct access to ‘delete’ when the messages pops us, was of great benefit. Maybe also a word of warning too. We found the P7’s back very slippy, putting it on many, what we thought were safe surfaces, only to see it crashing to the ground. Credit where credit is due - the phone is still working. However, getting a good case for it is strongly advised. What’s more, the P7 is quite affordable for a premium smartphone, coming in at the R6 700 mark as compared with its more expensive competitors which boast similar specs, many of which come in at or exceed the R10 000 price-point. 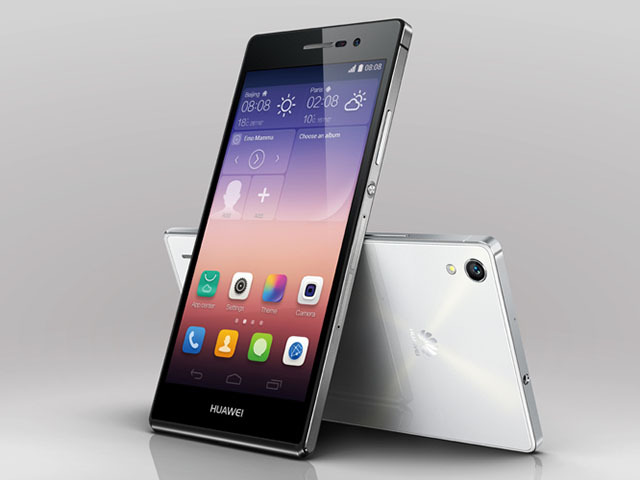 In essence, we dare say the Ascend P7 is a clear indication that Huawei has thrown down the gauntlet. Now that we have seen what the company produce, let’s just say that our expectations for the Ascend P8 are at the very top of the smartphone pinnacle. The Ascend P7 was received as a seeding unit.